. . . The Word Gang. They say writers are dreamers. In my case, that’s literally true. 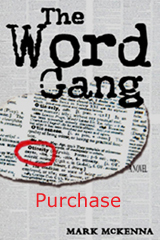 I woke up one morning with the basic plot of The Word Gang stuck in my head. As the weeks passed I kept thinking about the story. It’s fair to say I became mildly obsessed. New characters appeared, new plot twists. There was only one problem. Inspired, slightly mad, I came up with a plan — I’d get my friend Steve Strauss to write it, or at least, co-write it with me. Steve was a writer. He’d published a book on billboard advertising with the wonderful title: Moving Images. I’d tell Steve the story and he’d be so taken with it he’d fight to get on board. So on a beautiful California evening I invited him to take a stroll around Mill Valley. During our walk, as we dodged skateboarders and millionaires, I laid out the whole plot. My plan worked. He loved it. I swooped in for the close — and said something that still makes me cringe. Well, I already “had” the story. How hard could the voice be? After being inspired by Steve I did . . . nothing. For at least a year. The “I’m-not-a-writer” mindset put a wall between me and any chance of starting. No wonder they say you shouldn’t hold to fixed views. The next step involved another friend, Paul Sawyer. Paul was a computer genius, having founded SlideTek, one of the early successful Internet companies. Paul had an office full of old Macs, some even with the incredibly fast FX motherboard. Wow! But the SlideTek office provided my introduction to computers. The little screen was magical. It was like a color TV, only better. I could control it — or at least I’d be able to, once I figured out a few things. I remember spending hours in the Apple Menu opening and closing the little icons. What’s that one do again? Now, after brushes with .php and .css and tricky software galore, the simplicity of those early days amazes me. But back then I was in a transcendent state of beginner’s mind. The little Apple menu was like a magical doorway into a brave, new, mysterious world. At some point during my explorations I clicked an icon and a blank page appeared. It was like an apotheosis of “The Page,” glowing with a strange light. That’s when I started to write The Word Gang. My reasoning was simple: I may not be a writer, but I’ve spent my whole life reading. I’ve seen tens of thousands of pages so I must have internalized what a page should look like. It will simply be a matter of deleting the elements that don’t belong . . .
All the things that happen to writers happened to me. Once Laura Torbet, a friend and professional writer, said, “You have to cut a hundred pages out of this.” So I did. So I discarded my opening pages, pages I’d changed probably a thousand times over the years. Not an exaggeration. All writers go through this, or something like it. To be clear. Or witty. Or handle tricky plots. It just takes time. Although the Slide-Tek office marked the official beginning of my fiction career, in a way it began when I was only five or six years old. Like most children I was often asked, “What do you want to be when you grow up?” I would usually answer, “I-wanna-be-a-witer.” Of course, I didn’t know what a writer was. It’s just that the adults would usually say, “Awwww!” and as a young manipulator, I felt I was on to something. Now, many years later, I find I have become a writer. Looking back on it, I realize I spent many years in preparation. First I had to drop out of college, become a hippie, hitchhike around the country; become a hermit and practice piano eight hours a day (living on top of a mountain with no running water and a wood stove for heat); work every job where you can be called “Boy!”; paint things, build things, become a photographer, become a caregiver and spend years taking care of some very wonderful elderly and disabled people, sit with them while they were dying; write a slim volume of poetry — and finally start writing The Word Gang because I got the story stuck in my head and couldn’t not write it. I write about things I love, things that scare me, or things I’ve spent years puzzling over — laughter, odd glances, the East River, bright smells of spring, sooty overpasses with mysterious graffiti, a yard filled with trees that only exists in memory. My characters do surprising things, but I have faith in them. I trust my unconscious, keep one foot on the gas and a light hand on the wheel. I guess you could say The Word Gang was my first big road trip. So watch out for the occasional french fry stuck on the seat and enjoy the ride!